About Online Earning And Lifestyle: A Site That Tells Your Age In Your Photo! Here is a website that tells you your age. 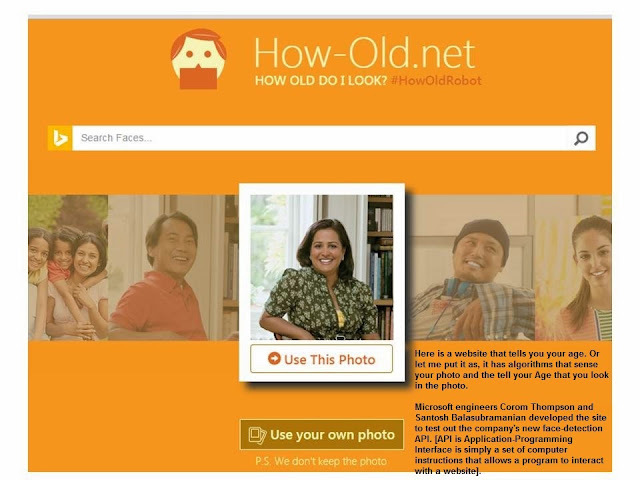 Or let me put it as, it has algorithms that sense your photo and the tell your Age that you look in the photo. Microsoft engineers Corom Thompson and Santosh Balasubramanian developed the site to test out the company's new face-detection API. [API is Application-Programming Interface is simply a set of computer instructions that allows a program to interact with a website]. When they were testing their face-detection API, they were hoping for, at most, 50 respondents to use the technology. The response was overwhelming. More than 35,000 tried it just in the first few days to see if the site could guess their age and gender. Now, it's just about everywhere you look online.